It's time for another Short & Sweet Saturday card. This card is going along with my Dashing Along Designer Series Paper Week. 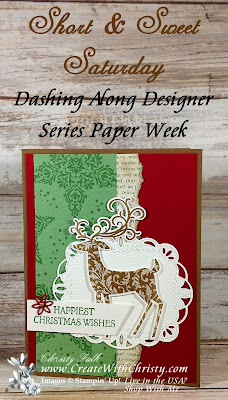 My last card for the Designer Series Paper (DSP) Week will be tomorrow. By the time it's posted, I will have showcased all of the designs in this beautiful Christmas DSP. Today's features both sides of one sheet. I sponged the "word" side of the paper to darken it up a little bit. As you can see, the right edge is also torn. I used one of my favorite stamp sets from the Holiday Catalog, Dashing Deer. I'm REALLY loving the Dashing Deer Bundle! I love the curly antlers on the two large deer in the bundle. They are so beautiful! 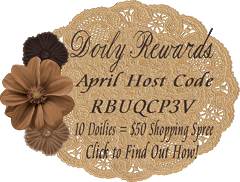 Would you like to know how you can get this wonderful DSP? 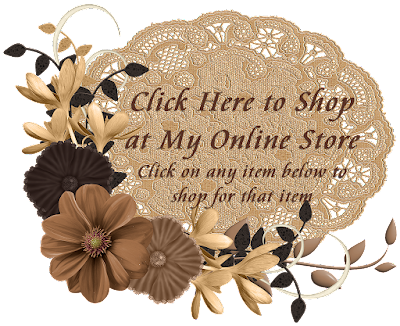 CLICK HERE to find out how you can get it, and for FREE! CLICK HERE to see the other cards I've made with it, too. Tear the right long edge of the worded paper from the Dashing Along DSP. 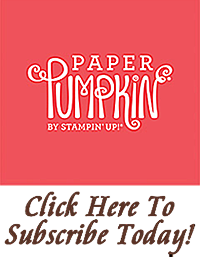 Using a piece of Stamping Sponges, sponge all of the edges of the piece, and across the top of the paper using the Soft Suede Classic Stampin' Pad. Attach the worded paper underneath the right, long side of the star paper, making sure about a 1/2" of the worded paper shows from the front. Attach the DSP to the left side of the Cherry Cobbler piece (see picture for placement). Fold the Soft Suede piece in half (fold on the left) to form the card base. 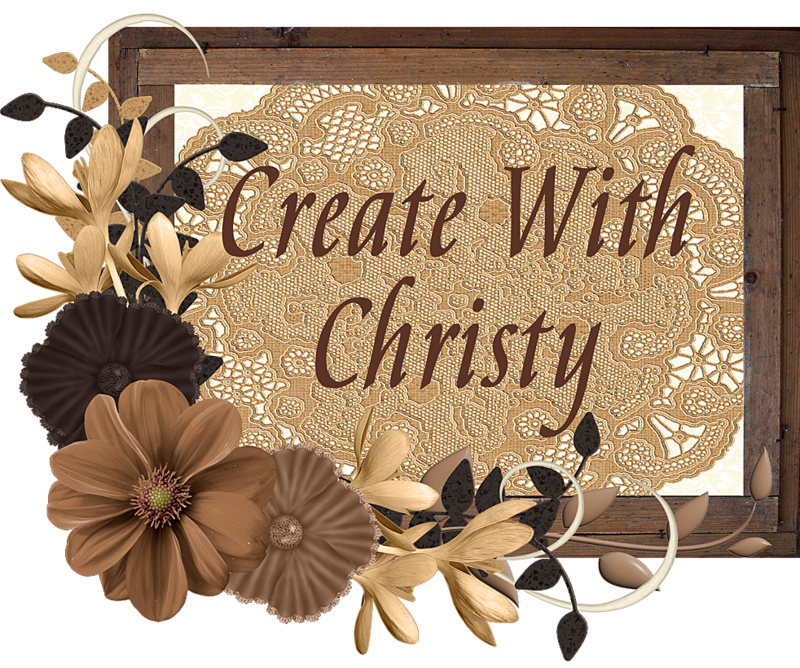 Attach the Cherry Cobbler piece to the center of the card front. 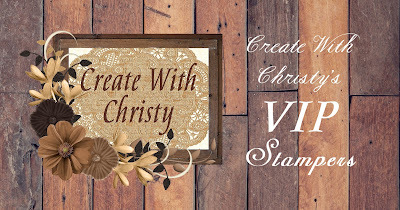 Die-cut a label out of the Whisper White label piece using the largest, label die in the Stitched Labels Framelits Dies. Emboss the layer by running it through the Big Shot with the Subtle Dynamic Textured Impressions Embossing Folder. Stamp the largest deer stamp from the Dashing Deer Stamp Set onto the Whisper White deer piece using the Soft Suede ink pad. Die-cut the deer out with it's coordinating die from the Detailed Deer Thinlits Dies. 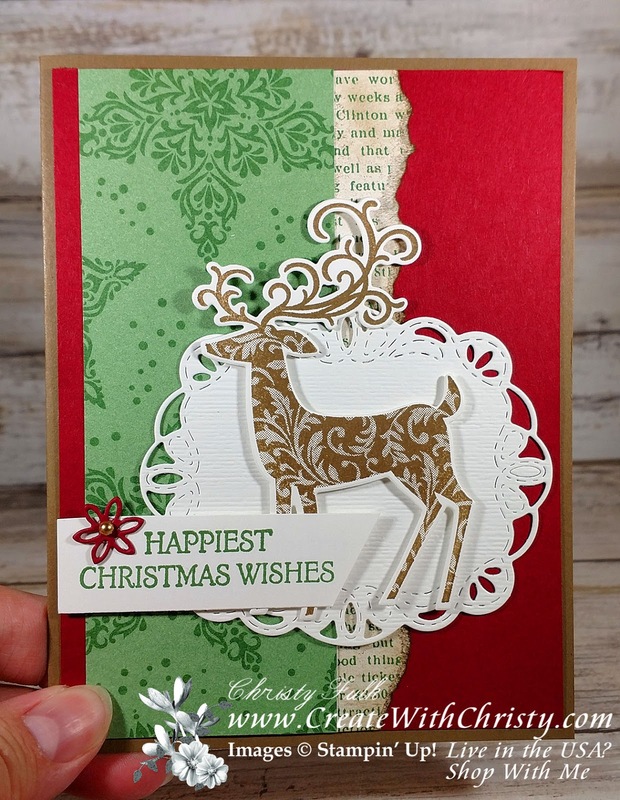 Attach the deer to the label using Mini Stampin' Dimensionals. Attach the label to the right side of the card (see picture for placement). 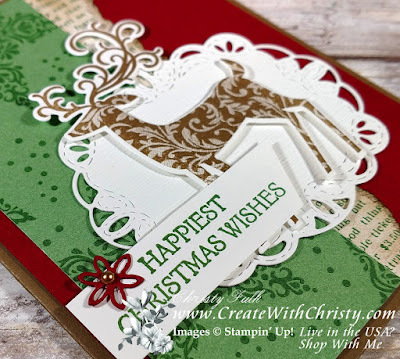 Stamp the "Happiest Christmas Wishes" stamp onto the left side of the Whisper White greeting piece using the Garden Green Classic Stampin' Pad. Cut the right end of the piece at an angle with Paper Snips. Die-cut a little poinsettia out of a scrap piece of Cherry Cobber Cardstock using one of the detailed poinsettia dies from the Detailed Deer Thinlits. Attach the poinsettia to the top, left corner of the greeting piece using a Mini Glue Dot. The glue dot will need to be pinched a little bit to make it smaller, after it's put on the back of the poinsettia's center. Attach a gold pearl from the Metallic Pearls. 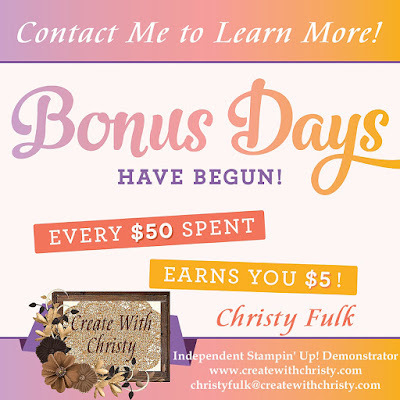 Put two Mini Stampin' Dimensionals onto the back of the left end of the greeting piece. Put SNAIL Adhesive onto the back of the right end of the same piece. Attach it to the bottom, left of the card (see picture for placement).